At Miller Park, Brewers mascot Bernie Brewer makes his home in Bernie's Dugout. 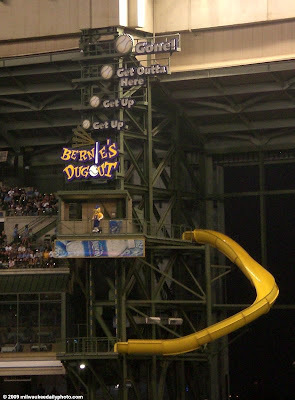 When the Brewers hit a home run, Bernie slides down the yellow slide and cheers from the lower terrace. It's not quite time for the Brewers to make their first appearance at Miller Park, but it's getting close, and we're packing to leave for Spring Training tomorrow!